The X-Rite 361T sets the standard in transmission densitometers.Thousands of desktop publishers, service bureaus, trade shops and printers rely on the 361T to monitor the quality of their film output. It delivers unsurpassed versatility and accuracy.Whether youre using the 361T for imagesetter linearization, exposure adjustment, processor quality control, or verifying duplicated or contacted films, you can be assured that youre getting the best possible results. The 361T is the only densitometer to make accurate density and dot area measurements from your films. It was designed especially to allow instrument calibration to a known density reference and calibration to a known dot reference as well. The 361T is unique because it has a built-in UV response mode for measurement of otherwise invisible film base fog. An ordinary densitometer is not sensitive to UV blocking that can occur in the seemingly clear film base. The UV response of the 361T can also be used to evaluate diazo films which are commonly used in the production of electronic circuit boards. Using an RS232 interface you can record readings directly into a spreadsheet for quality control analysis. It is also possible to transmit data directly to your RIP to automate your calibration process. Extraordinary accuracy when measuring density functions. Able to measure densities exceeding 6.00D. Automates data entry into calibration software for imagesetter or platesetter systems. Sequence mode enables a consistent measurement procedure. High-contrast, adjustable display that is easy to see and easy to use. The most accurate industry dot area measurements, enabled by a separate calibration mode, ensures you are evaluating films properly. 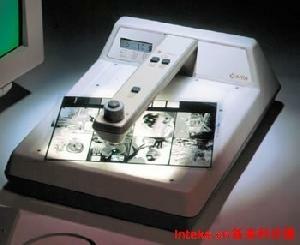 Can be combined with X-Rite 508 to measure solid and screened areas on both film and paper. Can be combined with X-Rite 518 Spectrodensitometer for monitoring color proofs, press sheets, films, and paper output. Includes X10 mode to measure density or dot sizes precisely. Directly measures negative and positive percent dot area. Conforms to ANSI PH2.19 and ISO 5/2 standards for transmission densitometry.